eWebmin has a product for any size company. Don't get hassled into the mindset that everybody pays the same price, those days are long gone. You pay for what you will need. How simple can we make it? 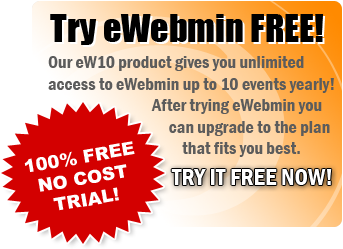 Choose an eWebmin product that works for your company below. If you have any questions then feel free to contact us. * The total number of events allowed to be entered into eWebmin annually from start to end of renewal period. Dozens of reports to choose Custom Setup Options ...and many more features!